You are here: Home � All Deals , Retail: Clothing Toys Baby Shoes Children , Reviews � LeapFrog Fridge Farm Magnetic Animal Set for Babies and Children 12 months or older only $10.00, read our review below. 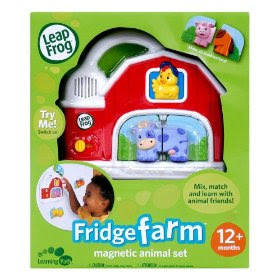 LeapFrog Fridge Farm Magnetic Animal Set for Babies and Children 12 months or older only $10.00, read our review below. LeapFrog's Fridge Farm Magnetic Animal Set is currently on sale through Amazon.com for $10.00. Our Children actually have this fridge farm and it's a great little toy. It is designed to encourage children to put two pieces together to make a farm animal. When they get it right our kids will often break out in dance when the toy sings a little jingle in celebration. When you get it wrong like for example pairing a Duck front with a Cow back the fridge farm starts to joke around with the child explaining "how silly a Duck-Cow is" or whatever odd animal pairing they make. This is by far one of our kiddos favorite toys. The lowest price we could find for this item from another seller was $14.85 as of this posting. Click here to read other thoughts and reviews on this offer, or to take advantage of this price.